If you’ve been to Concrete Town Center recently, you might have noticed a marked change in the appearance of the buildings along the south side of Main Street. Those brand-new coats of paint are largely because of a small band of local volunteers who decided to make an effort to help any interested business or building owner spruce up their building’s exterior. The men are Robert McWilliams, John Boggs, Bill Sullivan, Jim Hillman, and Adolph Nieshe—all locals who simply want to do what they can to improve the town center’s streetscape. In May they began an effort to power wash most of the buildings along the south side of Main Street. 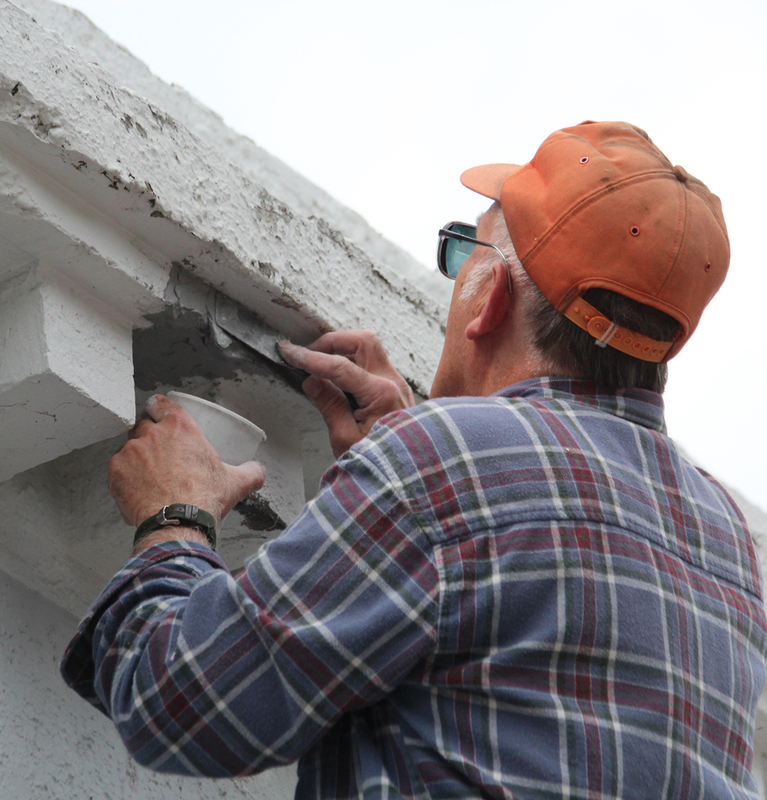 John Boggs has since been patching, prepping, and priming the buildings. And in June, McWilliams—a painter and artist—began doing what he does best: layering on color schemes according to the wishes of the buildings’ owners. So far, the Concrete Food Bank and The Washington Cafe and Bakery buildings are all but finished. The group is working with the Concrete Legion and Baker River Trading Post building owners to select their color schemes. 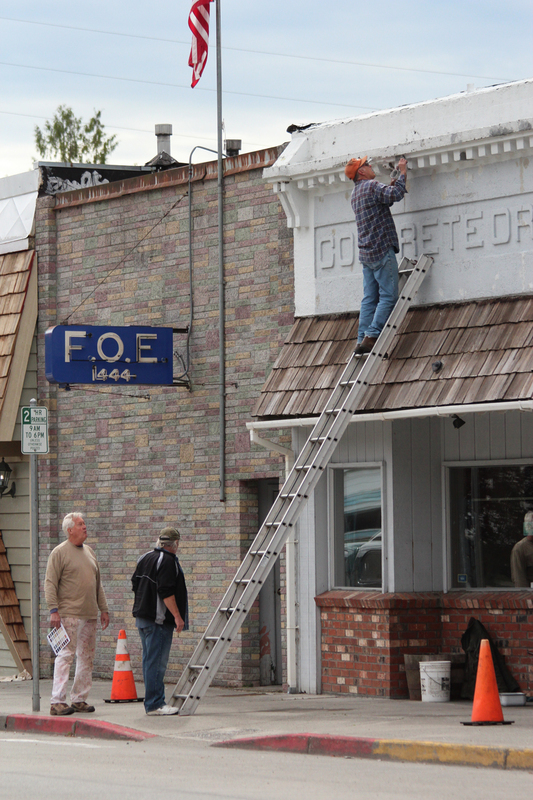 The Concrete Drug Store building—which most recently housed the Eagles Club—is in line for a paint job too, as soon as Boggs finishes patching up its cornice and dentils, which were badly cracked and crumbled in spots. And the building between the food bank and Legion hall, owned by Roger Kindler of Sedro-Woolley, recently got a fresh coat of paint inside and out by members of Upper Room Fellowship, a faith-based organization that moved in July 1. The response to the group’s efforts has been overwhelmingly positive, said Melissa Swanberg, who owns The Washington Cafe and Bakery with her husband, Mike. “Guests have said Concrete hasn’t looked this good in years. We greatly appreciate all the time, effort, and energy so lovingly given to our cafe and the Concrete business community,” she said. Volunteer John Boggs applies a cement paste to the edge of the cornice on the old Eagles building facade. Boggs also plans to repair several crumbling dentils (the boxy protrusion near his left hand) before Robert McWilliams paints the building. 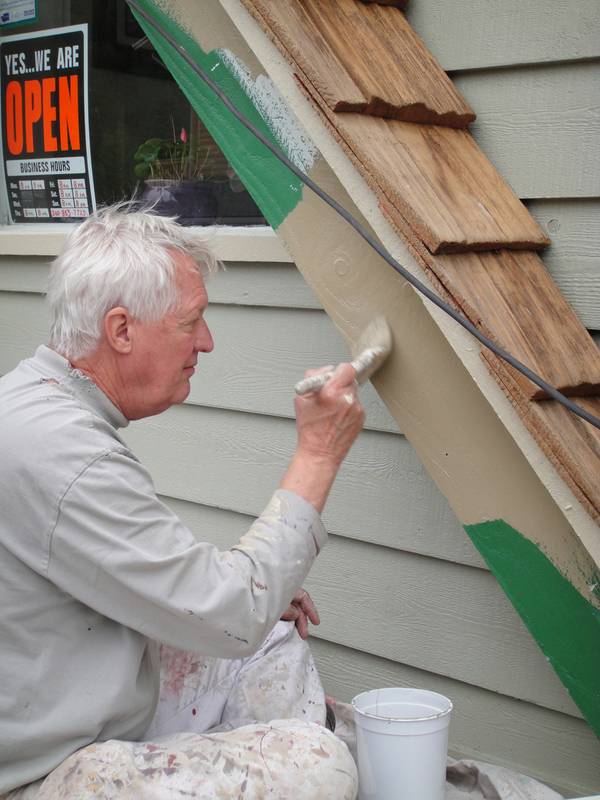 Volunteer painter Robert McWilliams paints the trim on The Washington Cafe & Bakery. Volunteer painter Robert McWilliams (left) and Bill Sullivan talk with John Boggs (on ladder) as he works to repair the old Eagles building’s damaged facade.